June 2012. In the days and months following the Deepwater Horizon oil spill, all eyes were fixed on images of where the oil was going and what it was impacting. Two years later, the focus has shifted to things unseen: Where is the oil now and what are the long-term consequences for marine ecology? 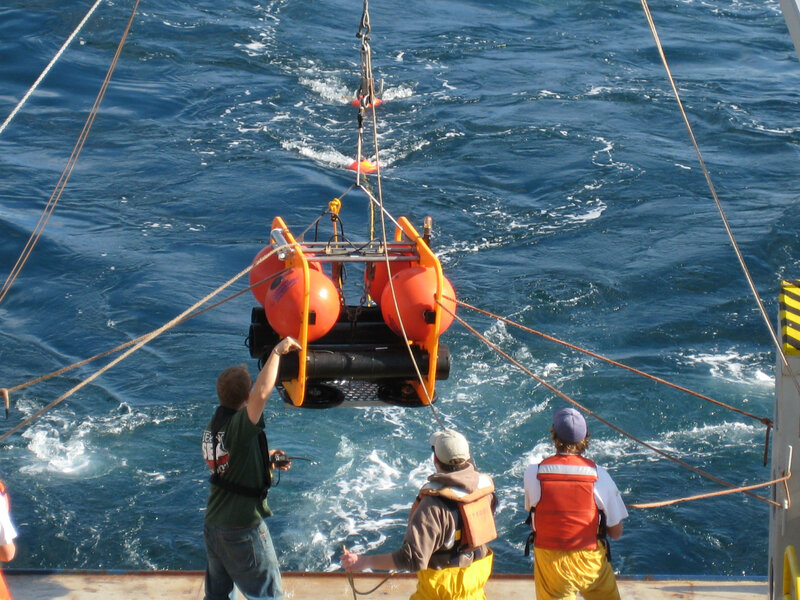 Funded by a Gulf of Mexico Research Initiative (GoMRI) award, the Consortium for the Integrated Modeling and Analysis of the Gulf Ecosystem (C-IMAGE) led by Dr. Steven Murawski at the University of South Florida (USF) has a sense of urgency as scientists take to the seas over the next three years seeking answers to these questions. 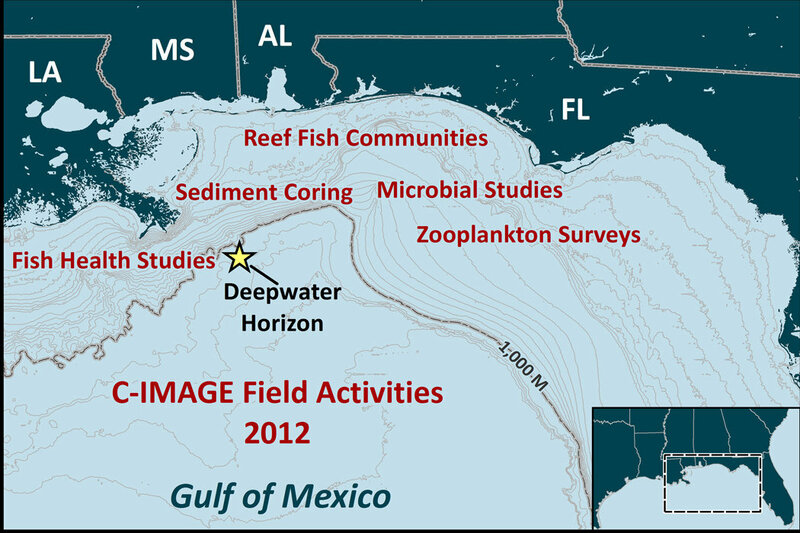 (Click to enlarge) Areas of focus in the Gulf of Mexico for C-IMAGE research. graduate students will work side-by-side with scientists, gaining experience in sampling and handling the challenges of field work in the deep sea. This hands-on research is also translated into student theses, dissertations, and publications. The C-IMAGE education and outreach team, led by Dr. Teresa Greely (USF), is coordinating a Teacher At Sea experience. Participating educators will assist with equipment deployment and sample retrieval and analysis, while gaining new knowledge and experiences they can bring back to their students. 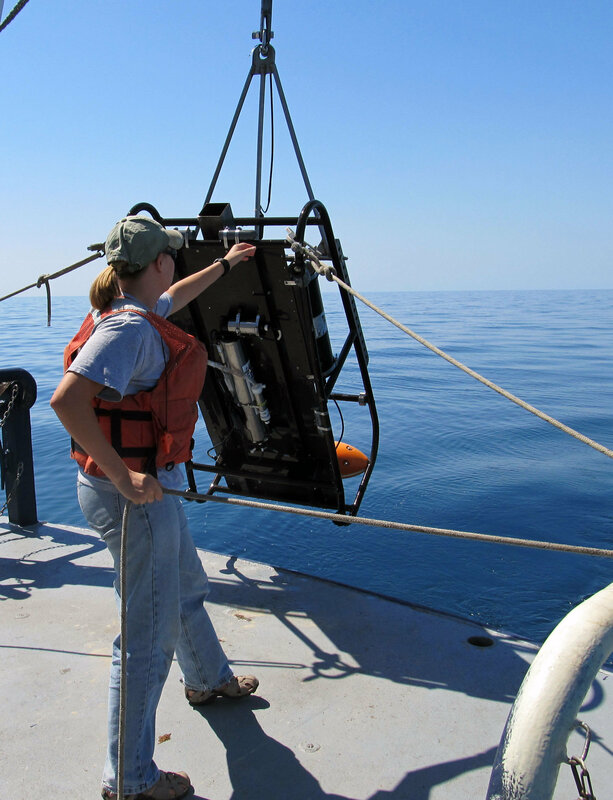 The C-IMAGE collections of marine samples, imagery, and sounds will extend and expand upon the pre-spill and immediate post-spill collections. These time-series data will help scientists with the difficult task of identifying the effects on long-living organisms and habitats and separating the impacts of multiple stressors such as the oil spill, response efforts, natural conditions, and industrial activities. Through systematic long-term monitoring at sea and development of innovative analytical techniques, C-IMAGE scientists are going full steam ahead to sort out the impacts of this unprecedented pollution event. To understand how much of the released oil is buried in the sediments on the sea floor and its toxicity level, scientists are analyzing cores of deep sea sediments from areas near the spill site. Drs. David Hollander and Benjamin Flower (USF) and Drs. Gregg Brooks and David Hastings (Eckerd College) use a multi-core system that simultaneously collects twelve sediment cores to measure the amount, source, and chemistry of the oil found in these samples. 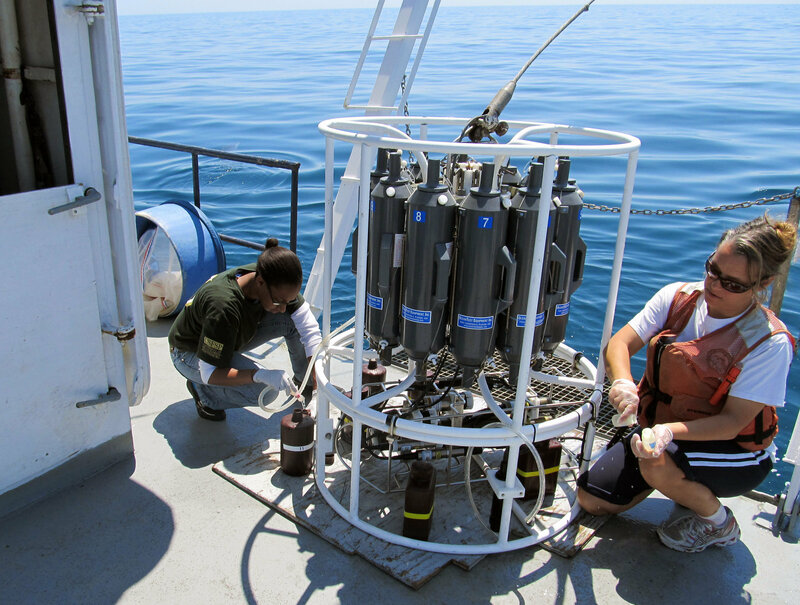 To understand the potential long-term impacts of oil on plankton populations and microbial communities, important parts of the marine food web, scientists are monitoring the De Soto Canyon and west Florida Shelf. Dr. Kendra Daly (USF) uses the SIPPER (Shadow Image Particle Profiling Evaluation Recorder) to measure zooplankton abundance and detect oil droplets. 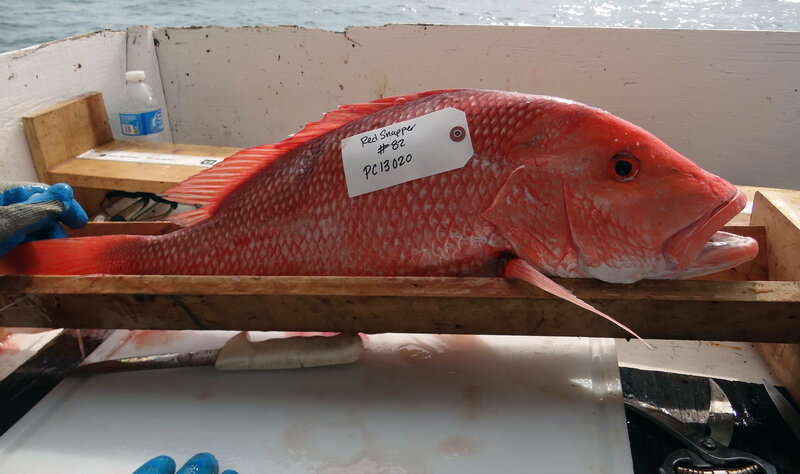 To understand the health of fishes and potential long-term sub-lethal impacts of oil and dispersants, scientists are monitoring reef fish communities and other select species in the Gulf. Dr. Will Patterson’s (University of South Alabama) research incorporates an ROV (Remotely Operated Vehicle) using video and CTD (Conductivity, Temperature, and Depth) measurements to monitor reef fish communities at natural and artificial sites south of Mississippi, Alabama, and Florida. Dr. Murawski uses specially-outfitted cables for bottom line surveys off the Louisiana coast to target specific fish species for tissue analyses. Dr. John Hildebrand (Scripps Institute of Oceanography) records underwater sounds with a HARP (High-frequency Acoustic Recording Package) to estimate the number of marine mammals potentially exposed to oil and population changes after the spill. Research at sea requires specialized equipment and people experienced in vessel operations. To meet this need, C-IMAGE is coordinating much of their field work with the Florida Institute of Oceanography using the R/V Weatherbird II and the R/V Bellows. C-IMAGE is comprised of sixteen research institutions spanning five U.S. states and three countries. These scientists are using a systems-level approach to understand the linkages of physical oceanography, chemistry, and biology to help them understand the ecological consequences of the oil spill. C-IMAGE’s field work at sea is a critical component in building the foundation for improved observational and predictive tools for future oil spills.